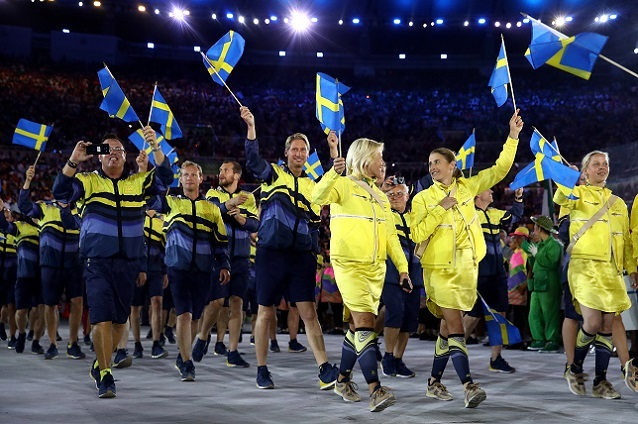 H&M dressed the Swedish Olympic team at the Opening Ceremony of the Olympic Games in Rio de Janeiro. 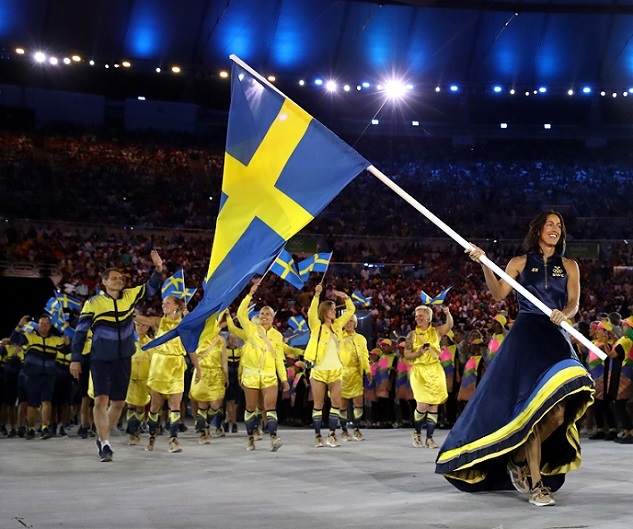 The collection has been created in collaboration with athletes from the Swedish Olympic team and includes opening ceremony uniforms, selected competition pieces and the prize ceremony outfits. The athletes have been involved in the development of the garments, advising on design, performance and wearability. The collection is based on the colours of the Swedish flag - yellow and blue - and created with a modern twist focusing on high technical performance combining fashion and function. Some of the garments in the collection are sustainable and made of recycled polyester, which is created from recycled PET bottles. The flag bearer, swimmer Therese Alshammar, wears a dress specially designed for this occasion made of sustainable materials such as Tencel® and organic silk. The striped decorations in yellow, blue and black are made from recycled garments collected through H&M’s garment collecting boxes, where customers are encouraged to hand in their old clothes and give them a new life. Approximately 10 old garments were used to make the decorations. H&M has created competition outfits for the following sports: Archery, Athletics, Badminton, Canoe, Golf, Handball, Rowing, Shooting, Table Tennis, Tennis and Soccer.